Mix the unpeeled granny apples; collect the juice and add the lemon one. Re-hydrate the gelatine in cold water. Mix sugar and vanilla into the apple juice; combine the gelatine and pour in the cup (20 g per person). Peel the Granny apples and with a half sphere corer carve some balls (1/2 cm of diameter). Warm the mixed apple juice with sugar and vanilla. Pour the apple balls in the syrup and let cook for 3 minutes, mixing well. Drip the apple balls and re-hydrate the gelatine in cold water. Mix the apple puree, the apple juice, the vanilla and the Manzana. Melt the gelatine and make a pre-mixture with the puree. Mix all together and place in the cup (50 g per cup). Re-hydrate the gelatine in cold water and whip Flaurette cream with sugar. 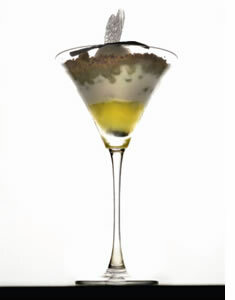 Melt the gelatine, make a pre-mixture with Fleurette cream and combine with the rest of it, then add the Champagne. Garnish the cups by tilting them heavily (16 g per cup) and freeze. Mix the ingredients, then put in the fridge. When the dough is well cold, grate and cook in the oven at 150°C for 20 minutes (8 g per cup). Warm the water together with the unpeeled rinds and the vanilla. Mix the sugar and the stabilizer, then pour in the water. Boil, then cool and embellish with Champagne. Whip. With the help of a pocket with a small opening make some sorbet roses on a cold plate. Freeze. Cook the sugars in the water, then let cool. Mix and pour the mixture into the apple shaped moulds and cook in the oven at 150°C for about 2 minutes. When extracting from the oven garnish the sections with stems and seeds with a small horn containing brown Isomalto. 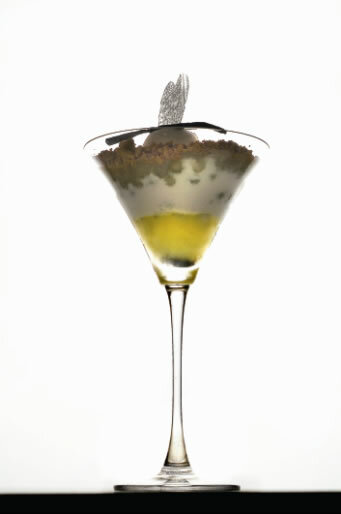 Place the streusel (previously passed through the golden dust) in the cups decorated with gelatine, Champagne mousse and apple mixture, then add the Champagne sorbet, the apple decoration and a piece of vanilla stick.